Increased incidences of scale have been observed in Sacramento Valley walnut orchards for upwards of 10 years. Reasons for scale increases in walnut are not entirely known. Commonly, when a secondary pest emerges as a problem, it is because something else within the system has changed, allowing conditions to favor the pest. For example, the parasitoids and/or other biological control agents that were previously keeping scale populations regulated may have become disrupted by changes in pesticide use. Alternatively, broad spectrum insecticides that are no longer used may have been providing more scale control than previously thought. Cultural changes may also play a role, with factors such as changes in tree spacing and canopy management contributing to more favorable conditions for scale. 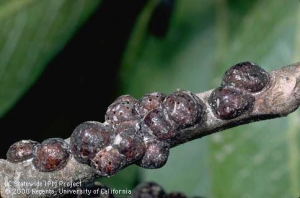 Walnut scale is an armored scale (the cover is separate from the body) that has become relatively common in walnut orchards. In high populations, it is found in crusted layers on older branches and scaffolds. 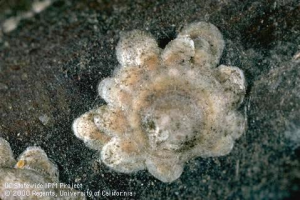 Walnut scale appears to have a ‘daisy’ – like outline when mature. Female walnut scales lay eggs underneath her protective cover before dying. The eggs hatch into an immature insect known as a ‘crawler’. Crawlers are small, yellow, and mobile; they seek out new feeding sites either by crawling or being carried by the wind. They require magnification in order for you to see them clearly. Once the crawler selects a new feeding location, it settles down, secretes the protective waxy cover, and remains sedentary for the remainder of its life. Walnut scale completes two generations per year. Frosted scale is a soft scale (cover is the body wall of the scale) with a domed appearance, frequently described as an ‘army helmet’. Unlike walnut scale, which can colonize older wood, frosted scale is typically found only near the actively growing tips of walnut shoots. Mature frosted scale. Note that several of them are dotted with exit holes from parasitic wasps. For a brief period in spring, frosted scale are covered with a white waxy coating for which they are named; however they do not have the distinctive waxy appearance the rest of the year. Like walnut scale, frosted scale lay their eggs under their protective cover. The crawlers move to new (green) shoot and leaf growth where they feed for the duration of the summer. In the fall, crawlers move back onto woody permanent growth, where they overwinter. In spring, the scale rapidly develops into adults, followed by mating and egg laying for the next generation. Treatment timing is important for good scale control. A delayed dormant spray is the traditional timing and, depending upon the pesticide, has done a good job of controlling this pest while also causing less harm to beneficial parasitoids. During the growing season, the scale cover, which helps to protect against predators, also conveniently protects the scale from many pesticides. Scales are very susceptible to pesticide application during the crawler stage when they are exposed. Timing of the crawlers depends on which species is in your orchard, as well as the seasonal conditions. To monitor for scale, wrap a piece of double-sided sticky tape around a branch where you see scale populations. Remove the sticky tape weekly and check for the presence of crawlers (usually on the margins of the tape) using a magnifying lens. Replace the tape with a new piece each week.